Mike Smithson has managed to get £100 on at 6/1 that Fred Goodwin will give up some of his pension before the end of the year. This could be a good bet but the natural cycle of news means that this story will only last a few more days maximum before other things start to bump it down the running order. Once that happens and it is fading away, it will not be in the government’s interest to do anything such as legal action or legislation to bring it back to the top of the agenda. So, I think that unless Shred backs down in the next few days then he will keep his pension pot in full. If Mike Smithson on Political Betting is correct today then the terrible press that the government has received today (see here, here and here for examples) about Fred (The Shred) Goodwin's £650,000 pension is entirely their own fault. Apparently the government leaked the information in order to divert attention from the ostensibly bigger story about the £24 billion loss that the Lloyds group has made. Unfortunately for the government, the story actually has synergy with the loss one and they obviously did not realise just how dreadful it appears for an ex CEO of a bank to get a pension of 2/3rds of a million pounds a year when he has presided over the biggest loss in UK corporate history. It embodies all that is wrong with corporate culture in this country and could almost have been created to yield the headline "reward for failure". That they overlooked this shows just how out of touch they are. Allied to this, there are now allegations that the government either did know, or certainly should have known that some of Shred's pension was not formally agreed before ministers became involved in the running of the bank so they could (and certainly should) have intervened. I think this story could prove to be the one that in retrospect sums up what has gone wrong with this government's attempt to manage this crisis and also highlights the systemic problems that they have allowed to flourish unfetterred for the last 12 years. If that is the case then they would have been much better off not leaking the story but they just cannot help themselves. A government that lives by spin, dies by spin. Just heard on the closing headlines of The World at One that John Hutton has just admitted to the House of Commons that there has been at least one example of UK forces handing over a suspect to the US in the sort of rendition circumstances that had previously been denied. He trotted out the usual government formula of "we knew nothing" and "previous statements were in good faith". So incompetence it is then. What annoys me most about this sort of thing is that the government will loudly deny for years that it has not been happening and then when there is finally evidence to the contrary, they sheepishly slip out the truth hedged with all sorts of caveats. It is exactly this that makes the public not believe politicians in the first place. They should be much surely of their ground before coming out with the denials in the first place. Jack Straw's decision to veto the release of cabinet minutes in the run up to the Iraq war is causing some consternation at the moment. However, I agree with his decision. There is an understandable desire from the public and some politicians who are not in government to have this sort of thing released but it would be wrong to do so. What would end up happening is that cabinet would move away from being the forum for open debate and discussion and instead the decisions would be taken away from there and then rubber stamped by cabinet. It would ultimately lead to less openness, not more. I know that some people will be thinking that this happens anyway at the moment, and Tony Blair's sofa tendency bears this out to an extent, however it would get much, much worse if information was regularly released as was being proposed. There is certainly a case for reducing the 30 years rule as I have blogged about previously, but the minutes being referred to here are only from 6 years ago. That is too recent and many of the protagonists are still in office including the Prime Minister. It would set a dangerous precedent that would ultimately be to the detriment of government in this country. I find myself in the uncomfortable position of not only defending Jack Straw but also to be in favour of censoring the release of information. Even though it goes against the grain there are strong reasons for supporting this veto. Frank Field has a very interesting comment piece in The Times today where he sets out what he thinks is wrong with the welfare system in this country. He has some thought provoking (and politically provcative) ideas which I suspect will chime with the opinions of many in this country. He is a very well respected MP and is clearly very passionate about this subject. However what I want to focus on is something tangentially related to this that consistently bugs me about politcal debate in this country. I suppose the quickest way I can sum it up is that the simplest argument with the clearest message tends to win the day. Anything more nuanced or complex that cannot be condensed into a simple one sentence soundbite struggles to be heard. In his article, Field is corruscating about the New Deal which Labour brought in in 1997 to try and reduce youth unemployment. He explains how it has basically been an expensive failure and £75 billion has been spent without much effect. I don't want to get into the details of this, I trust Field's figures as an acknowledged expert by all sides in this area. What I want to mention is how over the last 12 years, Labour politicians from Tony Blair and Gordon Brown down have used the New Deal as a stick with which to beat the opposition parties. I have lost count of the number of times I have heard Labour MPs say something like "We introduced the New Deal which my opponent voted against". It is as if by definition their policy must have been the right thing to do and any opposition to it is mean spirited and means that their opponents are against reducing youth unemployment. It is an easy (and cheap) soundbite which doubtless over the years has helped to paint opponents of the New Deal as in the wrong, even though the main objection has always been that it will not work. The opponents of it have now basically been proved right. I have seen this sort of thing happen thousands of times over the years. In fact Sarah Teather did it last night on Question Time to Tony McNulty when she mentioned that Labour had voted against transparency for expenses. Now I am in a difficult position here as I think Labour were definitely wrong to vote against this but McNulty did actually have a reasonable defence which he tried to articulate but it was more complicated that Teather's position, hence it got lost and he just looked shifty. Another example of this is in the debate around drugs in this country. The simple argument is: Drugs kill people, especially the young and therefore they should be banned. The first part is absolutely true, they do kill people. However the simplistic argument does not engage with the plethora of nuance and consequences of the "war on drugs" which has palpably failed by any yardstick you care to use. The simple argument wins the day, over and over again. In his book Bad Science, Ben Goldacre says that he would like his catchphrase to be "I think you'll find it's a bit more complicated than that.". I think this would be an excellent catchphrase to be used more often in political as well as scientific debate. Let's not take the public for fools. Most people can understand complex arguments as long as all the information is given. Instead of squeezing things into 15 second soundbites, we should be trying to engage with arguments properly. This is one area where blogging is starting to change the nature of political debate and I am hopeful that this will continue in the right direction. I was just listening to this week's Any Questions (in the bath, on my iPhone, via iPlayer - ooh, get me!) and I was particularly unimpressed with Denis MacShane's response to a question about the recession. He seemed to be saying that nobody predicted it, everyone thought the way we were going was right and asked Janet Street Porter for examples of newspaper editorials and comment pieces that forewarned what was going to happen. Now aside from the fact that there were all sorts of warnings years ago (not least from Vince Cable who has been banging on about this for several years and was consistently dismissed by Gordon Brown as scaremongering - a point that Jo Swinson skewered MacShane with), I have to say to Denis MacShane that Labour have been in power with huge majorities for almost 12 years! How the hell can he be trying to blame other people for "not warning us" (even though they did)? The Labour Party seems to be in denial (in the upper echelons at least) about what has happened. Blaming other people might have worked for the first few years of government (they kept blaming the Tories for things for several years after 1997) but this simply will not wash now. Even if others had not been warning (which they were!) it is the government's job to keep track of what is happening, make sensible predictions and plan prudently for the future. God known Gordon Brown used the word "prudent" enough times in his speeches. The government has access to all the information (which it jealously guards for political advantage) so they cannot whinge when things go wrong. They were in a position to do something about it. Janet Street Porter was not. They need to think about how this sort of attitude plays with the public. Slopey shouldering everything cannot work as a long term strategy. The sooner Gordon Brown admits that he messed up, the sooner the pieces can be picked up and a serious effort made at sorting the problem out. They need to move from denial to acceptance. I was quite disappointed that the excellent question put to the panel on Question Time last night "What is the point of the ACMD if the government is continually going to ignore its recommendations" (paraphrased) was left until the last 5 minutes, thus not giving the panel much time to respond. The most sensible responses in my view came from Monty Don, the gardener and the leader of Respect, Salma Yaqoob, both of whom think that the current system is silly and Don even said he would legalise them all. Justine Greening for the Tories (who frankly had been very disappointing all evening - perhaps not the "rising star" many thought) peddled the usual uninspired Tory line on this. However the responses that bordered on the nonsensical were from Kelvin McKenzie, the tabloid hack and Liam Byrne the cabinet minister. McKenzie said that if anything the current penalties were not harsh enough and started banging on about how dangerous drugs are. Dimbleby tried to intervene to get him to answer the question and also to ask him how he reconciled his position with the fact that horse riding is more dangerous than taking ecstacy. His response was that taking Ecstacy is illegal so you cannot compare the two. At this point, Salma Yaqoob tried to intervene but was stopped by Dimbleby. I had hoped someone would draw attention to the complete nonsense he was talking. How are we ever going to debate this issue properly if people are allowed to say "It's illegal so you cannot compare it." as a clincher to an argument!? The entire point of this is questioning why it is illegal, that cannot be used as a means of closing down the debate. The sad thing is I think that people like McKenzie are so blinkered in this that they genuinely think this is a fair point. He seemed confused by Dimbelby's question and seemed to honestly think that the two things are incomparable. And I thought that tabloid hacks are supposed to be secretly very clever. Not on the evidence of this. As for Liam Byrne, well of course he was going to trot out the usual government line however what he said made even less logical sense than McKenzie. When pressed about the evidence and the fact that the government keeps going against it he said "I may not be a scientist but I am a father" and then banged on about how harmful drugs are. Again, he seems to think this is a clinching argument. Why exactly does the fact that he has managed to procreate mean that he is better placed to adjudge the risks associated with ecstacy than scientists who will have analysed and assessed the actual evidence for this? This is absolutely typical of the distorted and anti-scientifc political posturing of this rotten government. No attempt to engage with the actual debate or evidence, just populist soundbites appealing to emotion about the fact that he has children. Absolutely disgraceful. When a TV gardener talks more sense than two senior front-bench parliamentarians, you have to ask yourself what is politics in this country coming to. Watching This Week last night where one of the guests was the chef Anthony Worral Thompson, I was struck by something he said. He was talking about how he has had to close some of his restaurants and make numerous people redundant due to the credit crunch. He explained how during the good times he ran things very tightly and did not need much credit, he only expanded and opened new restaurants when he had the capital from profits from his other places to do so. He said that had he needed to, he was sure that 18 months ago he could have gone to a bank and got a couple of million pounds for more rapid expansion, however now when he needs only a tenth of that (£200,000) to tide him over and help get through the recession no bank would touch him with the proverbial bargepole. He was asked if in his opinion the pressure that the government claims it has put on the banks to lend has had any effect on the ground and in AWT's opinion the answer is absolutely not. This is anecdotally what I am hearing from all over the place. Now, I know that dining out is one of the things that suffers during a recession, however I am sure AWT knows his business and if he thought that a short term loan could help get through the current problems and hence safeguard jobs and businesses until we get through to the other side of the recession then surely that is better than all those jobs and businesses being lost and the knock on effect and cost to the taxpayer of lost taxes and benefit payments? If a well known and hitherto successful celebrity chef and businessman cannot even get a sniff of a relatively small amount (in business terms) of credit, then this says to me that the government has utterly failed in its attempts to free up the credit market. I have read in a few places that the nuclear option of nationalising the banks completely may have to happen if credit does not start flowing again soon. I previously thought this was fantasy but I am not so sure now. All the banks seem to be paralysed with fear. It is almost like they are sufferring from collective Post Traumatic Stress Disorder and seem incapable of doing collectively what would start to ease this crisis. Perhaps the state does need to step in and do it for them if they won't save themselves. I seem to be posting a lot about Jacqui Smith at the moment. I don't fancy her or anything honest! She just seems to be doing a lot of stupid things lately. Her latest wheeze to ban the contraversial Dutch MP Geert Wilders from entering the UK to promote an anti-Islamic film seems totally wrong headed as usual. Before a day or two ago, I had never heard of Wilders. If he had been allowed to come into the UK quietly and get on with what he wanted to, invited by a UKIP peer to the House of Lords to show his film, then I am sure his activities would have been reported in the news. It would have been maybe 3 or 4 in the running order of the headlines for one day. Instead, thanks for Jacqui Smith's political incompetence Wilders' boat has been all over our screens and his voice on the radio for the last 24 hours. Today on the BBC News channel it was the top story with a live interview from the airport with him, a reporter standing outside Heathrow and constant rolling "updates" on what was happening as well as an interview with David Milliband on the subject. I suspect as well that now lots of people will download his film and watch it (far, far more than would have done). Wilders is clearly a master at playing the media. He knew he would not get into the UK when he arrived at Heathrow but clearly saw it as a great opportunity to get a lot of free publicity. Smith and her moribund government have played right into his hands. The only way to deal with people like Wilders is to engage with the debate that they provoke. How could Smith not see this coming and when will she realise that trying to ban things like this just makes it worse in the end? There has been a fair bit of other blog reaction on this today too. 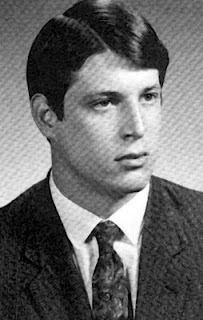 I came across a web page today with 15 photos of senior US politicians from their High School yearbooks. I heart Ben Goldacre. Platonically. Fraser Nelson from off of The Spectator questions Brown's 500,000 vacancies figure. It always sounded suspect to me. John Prescott has now got over 25,000 people to sign up to his "Give up the bonus" campaign. He really seems to be embracing the campaigning possibilities of the new medium in a way that most of his colleagues just don't get. Fair play to him. TDPF have a run down of the coverage in a big week for drugs stories. Dale-o (as he doesn't like to be called) has allowed Peter Hitchens a guest post on his blog to rip into him. Not sure this was a good idea. Hitchens already has the bully pulpit of his Mail column. Does he really need further outlets for his poison? And this last one is not a recommendation, in fact it is the opposite. Here is Ed Balls on LabourList showing exactly what blogging is not supposed to be about. It might as well be a Labour Party press release bashing the Tories and at the same time trying to lure them into a blatantly obvious political trap with bogus calls for "consensus". I am almost at the point where I will stop reading LabourList soon as it is just not entering into the true spirit of blogging at all. I have just been listening to Money Box where the subject of buy back and lease was being discussed. It reminded me of something I have been meaning to post about for a while and never seem to get round to. I now own my own home and have done for a few years but between 1992 and 2004 I lived in lots of different sorts of rented accomodation, both shared and on my own, houses and flats so I have quite a lot of experience of the rental market from a tenants perspective. Several times I had to chase the return of my deposit, often taking months and portions of it were kept for usually spurious reasons. I understand that there is a deposit protection scheme these days but apparently, even though they are legally obliged to use it, not all landlords do. In the latter years it was usually written into the contract that the house/flat had to be fully professionally cleaned from top to bottom (often costing hundreds of pounds). Cleaning it yourself was not even an option. It always felt like a scam this as the agencies would only accept certain cleaners in the area as ones they were happy with and I always wondered what sort of "arrangements" they had between them. Of all the rented accomodation I lived in, there was not a single one where I would have been allowed to keep a pet. I did not have one at the time (although one of the main reasons I did not was this restriction). I do have a dog now I own my own place. I am not saying you can never find a place that will allow this but it seems that "no pets" is the default position for the majority of privately rented properties. Just as an experiment one time I did try negotiating on this before I moved into one place but they absolutely refused to budge. I had unscheduled visits from landlords/ladies even though they are supposed to give 24 hours notice and come at a time convenient to you. One place I lived in, the landlady was pulling a scam with a mail order company by getting trial CDs delivered in fake names, getting her sister to pick up the mail from our house and then denying all knowledge when the threatening letters started arriving. This could have affected our credit rating. Many times I had appliances break down and either they were not fixed or replaced, or the repairs took a very long time to happen. I could go on but the point I am trying to make is that there are certain compromises you make when you decide to rent privately. You get the freedom to move at fairly short notice with no ties but you have to put up with a lot of crap (my list is fairly tame compared to some stories I have heard) and of course you are paying somebody else's mortgage off and making them rich at your expense. The worst thing however about privately renting in my view is the lack of security of tenure. In two of the places I rented, I was forced to move out on the whim of the landlord. The worst example of this was a lovely flat I lived in where I was very happy. During my time there I got made redundant from my job. Now I work in a highly skilled profession and there was no doubt I would get another decent paying job in a short while (it took me 2 or 3 months in the end - not bad). I wanted everything to be above board and because I would be claiming housing benefit I thought I owed it to the landlord/agency to inform them of this even though I subsequently discovered there was no legal obligation on me to do so. Big mistake. The first thing that happened was the landlord insisted on the next 3 months rent in advance in a lump sum. I could cover this because it amounted to roughly my redundancy payment. However 3 months later the landlord served notice of eviction on me. By this time I had already started my new job at the same salary as I had been on before but they weren't interested. I was out. I loved that flat and would have been very happy to stay there for years, until I had been in a position to buy my own property which was not to happen for another 3 years almost. To be honest, the stage of life I am at now, I would have bought my own house by now anyway but one of the things that spurred me on was lack of security of tenure. It is a big upheaval, and expensive (not to mention all the hassle of writing to 15 different companies to inform them and half of them getting it wrong) to have to move house every year or two and to be in a position where, once your initial period of 6 months or a year is up you are not sure when you might be forced to move out of your home was, in the end not something I was willing to put up with any longer. It seems to me that there are 3 broad areas of residential situation in this country. If you are very or quite poor then you can live in council accomodation usually with security of tenure which is often effectively for life. If you are better off but perhaps younger or in a situation where you can't be tied down, or cannot afford to buy a house then the only realistic option open to you is to rent privately with very little security of tenure. The third category and the one that I am now in are home owners/occupiers who, as long as they keep up the payments on their mortgage have security of tenure for life. I have always found it interesting that the consequence of the above 3 broad areas is that both the poorest, and the most well off in society have security of tenure whereas those in the middle as I was for many years have very little or none. The reason I think this is worth raising now is because one of the major drivers of the credit crunch has been the so called "sub-prime" mortgage market. Politicians and commentators have been queueing up to castigate the banks for lending to these people and I do think they went too far, but one of the reasons that the market existed to go too far with in the first place is because of the endemic problems with renting in this country. I am not an expert on the intricacies of what lie behind the situation around renting in the UK but surely there could be a rebalancing to give a much stronger security of tenure. Some relatives of mine lived in Holland during the 1980s and they still maintain strong links with the country now so I have been over there a number of times over the years. I know people over there find our obsession with purchasing our own homes in this country quite odd. However I knew a woman over there who was in her late 20s with a child and privately rented a beautiful flat with 3 bedrooms in a very nice area and she was paying the equivalent of £150 per month. This was in 1991 so it would obviously be more than that now but the crucial thing for me was when I talked about what her longer term plans were and when she would be looking to buy somewhere. "Why would I want to buy somewhere when I can stay here?" was her response. The situation she was in there of course was that she had security of tenure. Hopefully one of the things that will come out in the wash during the inevitable post-mortem that will follow the current recession is a root and branch reform of the private housing sector so that people are not coerced into buying a house just so that they can be sure of where they will be living next month. It's not often I agree so strongly with Simon Heffer but his column in the Telegraph today is pretty close to what I think about how some of the political class in this country behaves, with particular reference to Jacqui Smith. "We know Miss Smith's game. She will struggle to hold her seat at the next election, as Labour will struggle to hold the country. Faced not just with the loss of a ministerial salary but also an MP's one (with all its juicy expenses), and with life in the House of Lords perhaps no longer a gravy train, it makes sense to coin it in while you can. This includes having her husband on her payroll, too. If lean times hit the Smith household, there should be a bit of fat to live off while the Job Centre does its work." I am sorry to say that I think he is spot on here. I did not mention it in my previous post about lodgergate (as nobody else seems to be calling it!) but I did wonder if her behaviour could at least in part be explained by the fact that she has very little to lose because she will likely be out of parliament at the next election. Irrespective of all of this, I find it shocking that the parliamentary standards commisioner can have dismissed the case against Smith so lightly. He claims that there is not enough evidence against her. So the only conclusion I can draw from this is that if with such an obvious case of manipulating the system to claim that kipping in a spare room round at your sisters (when your husband, children and most of your personal effects are in a house 100 miles away where you appear to spend the majority of your nights, your own website refers to you "still living in Redditch" and your own spokesman in an attempted defence referred to your Redditch house as your "home") can be claimed as your primary residence then the system is very, very broken. I am very saddened that more of a fuss has not been made of this by the media and other politicians. Guido has been making a lot of running on this story (hattip to him for the Smith website bit above) and has written to the commissioner himself about this. I fully support his attempts to question this situation and keep the media's eye on it. Benedict Brogan senses rumblings afoot and that Speaker Martin could be out by the summer. We can only hope! Andy Reed at LabourList urges Brown and Mandelson to action on bonuses rather than just threats. I couldn't agree more. Nick Robinson on Ed's Balls-up. Mr Eugenides seems to agree with me on Jacqui Smith's diatribe today. I am very dismayed by Jacqui Smith's behaviour today in the Commons. She has made some disparaging remarks about Professor David Nutt's comment about the use of ecstacy. As I blogged about here on Saturday, Professor Nutt made some thought provoking comments about the number of deaths linked to ecstacy each year and how that compares with the number of people who die through horse riding. How can trying to raise an informed debate about society's attitude to something that hundreds of thousands of young people participate in each week be trivialising its dangers? Her behaviour today is trivilaising and debasing the entire debate. 'The council (ACMD), which advises the government, is expected later this week to recommend that ecstasy be downgraded from a class A drug to a class B one. So as I indicated in my previous post on this, the government is going to ignore the evidence and do what it thinks is politically convenient. 'Speaking during Home Office questions in the House of Commons, Ms Smith said: "I've spoken to him this morning about his comments. I've told him that I was surprised and profoundly disappointed by the article reported." Really!? Why is she so sure about this. Does she think that "most people" will not be able to look at the evidence and see that more people die from horse riding than from taking ecstacy? Why would they not accept this? Why are drugs put into some special undebatable category by politicians where any attempt to move outside the narrow confines of the status quo is met with tirades like this? Why on earth would she think that Professor Nutt is making light of this? As far as I can see he is doing exactly the opposite and trying to be measured and sensible. As for the insensitivity charge to the families of people who have died whilst on ecstacy, well this is just politics at its worst. Using the deaths of people as a political football to try and score points in a debate is about as low as it gets. To follow this through to its logical conclusion, any subject that is related to an issue where someone has died cannot ever be discussed because one could be accused of "insensitivity". Evan Harris MP has it spot on when he says: "What's the future for scientific independence if she [Ms Smith] asks that scientists apologise for their views?" If people are not allowed to raise this in the public sphere without being denounced under parliamentary privilege then I despair at where we will end up. Does Smith really think that the current system is working so well that we cannot even debate it? If she is intellectually sure of her ground she should be happy to debate this, on the real issues instead of throwing up straw men all over the place and appealing to emotion. Sadly, this has been the level of debate in this area of policy for years and there are few senior politicians brave enough to confront the issues involved head on. Skipper thinks Osborne is doing a better job at lambasting the bankers than Darling. Tory MP Douglas Carswell reckons that England is starting to get angry about the state of things. I am indeed angry about some of what he says. John Prescott is trying to get a campaign off the ground to prevent bonuses being paid to bankers on "Go Fourth". I would sign it but I don't want to be associated with trying to get Labour elected for a fourth term! John Jackson on Open Democracy asks if David Milliband has breached the rule of law. Mark Wadsworth reckons that a climate of fear is being created. I have been following Ben Goldacre's Bad Science blog for a couple of years now. It is an excellent read. He really gets into the detail of medical and pharmaceutical issues with an endearingly self-confessed nerdiness. I also read his Bad Science book before Christmas and I can highly recommend it. One of the issues of recent years that he has campaigned most strongly on is the MMR hoax which erroneously linked the triple jabs for measles, mumps and rubella with bowel disorders and autism. Just to clarify, there is no credible evidence of any link at all. However that has not stopped much of the media from very strongly giving the impression that there might be a link and that scientists are unsure. They are not unsure, there is no evidence. Ben's valiant efforts to expose the misreporting of this issue have been very much appreciated by those of us who believe in the scientific method and using a solid evidence base to make decisions. Although I have no children (yet) I would not hesitate to give them the triple jab. Anyway, he seems to have got himself into a spot of bother with LBC about this issue. He posted an entry a few days ago which strongly criticised Jeni Barnett, an LBC radio presenter who had run a phone-in show on MMR. Rather than be impartial, she had taken a strong anti-MMR stance and was highly critical of those who disagreed with her. I am not going to go over it all again as it is covered in the links in this post but one of things Ben did was to post a 45 minute excerpt from the offending LBC show on his blog as he felt that it was only by doing this that he could avoid accusations of taking things out of context. I have listened to the excerpt and Barnett's inability to grasp basic scientific concepts is utterly shocking. She is also hectoring and rude to the callers who disagree with her. LBC then contacted Ben and threatened him with legal action if he did not take the clip down. He has now done so, even though he felt that the use of the clip was fair. However I think LBC have grossly underestimated the power of the internet. There is a phenomenon known as the Streisand Effect which says that any attempt to censor or remove a piece of information from the internet is doomed to backfire. Indeed that has proved that case as the excerpt has now been put onto wikileaks and is hosted in all sorts of other places following the threat. In fact it is no exaggeration to say that many more people will now have listened to the clips online due to LBCs actions than would have been the case if they had kept their legal department at bay. Jeni Barnett did post a half-hearted apology on her blog which did not in my opinion go far enough but to give her her due she has allowed comments on there and appears not to have attempted to censor them. Many of the comments are extremely critical of her and her approach and go to the heart of why what she did was so irresponsible. This whole episode to me demonstrates why it is dangerous to allow ill-informed people to have lots of airtime to espouse their views largely unopposed. I am of course for freedom of speech but there is a real risk that when people like Barnett get on their soapbox about issues they know nothing about, that people will act upon their advice and they will then in this case be risking their own and other children's health. It can surely be no coincidence that the measles rate has shot up in the last few years as the vaccination rates have commensurately dropped due to this bogus scare of the last few years. At the very least, Barnett should have had someone like Goldacre on the show to stand up for the opposing view. EDIT 1: Following a comment from Lonely Wanderer below it appears that Jeni has now decided to get rid of all the comments on the thread I referred to, so I withdraw the credit I gave her for that. She can't even run a blog properly and has no idea of the etiquette. You don't just delete all comments to a post en masse. EDIT 2: The Quackometer has archived the deleted blog post and comments here. Also, Ben has done a follow up post here and it is great to see just how many people (some very influential) have now got involved with this campaign. Dale-o (as I like to call him) has a post today about Labour's apparent attempts to shift the focus of their attacks on David Cameron from being an out of touch toff t0 being a "nice guy" in charge of an unreconstructed right wing party. Iain thinks that this is doomed to failure. 1) They claimed he was too inexperienced. The problems with this are that he is no less experienced than Tony Blair or much of his cabinet were when they came to office in 1997. 2) They claimed he was a chameleon and that he changed his policies to suit the weather. Well, that's funny because that seems to be exactly what Tony Blair used to do, rather successfully as I recall. 3) He was Norman Lamont's "chief adviser" on Black Wednesday. This never really rang true as senior politicians have lots of advisers and it is unlikely that Cameron in his mid twenties had much influence back then. Of course, now the economy has gone down the swanny, Brown cannot use this attack anyway. 4) The Tories are a "do nothing" party. Whatever you might think of them, it cannot be plausibly claimed that they would do nothing about the recession. They have made lots of suggestions. 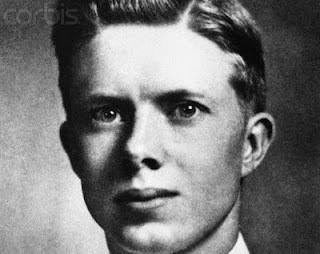 1) He is a lightweight, hence the nickname Bambi. As he imposed his will on his party via the ditching of Clause 4, they soon abandoned this link of attack. 2) He is too inexperienced (see above). I distinctly remember John Major making exactly this point. That is an argument for permanent incumbency and is therefore by definition nonsense. 3) He might be a centrist but he is leading an unreconstructed left-wing party. Sound familiar? Of course it turned out to be nonsense once they got into power. If anything New Labour have been more right-wing than most governments in this country's living history. There was one other thing the Tories did before the 1997 election campaign which I personally thought was the worst thing they could have done. They did a party political broadcast which was based around the at that point hypothetical election of Labour as the government and then took the viewer through what they could expect to happen. I remember after a year or two, John Prescott would resign from the government and lead a huge backbench rebellion or something. The huge problem with this broadcast was that it made it seem plausible that Labour could win. The Tories were saying so! The broadcast used phrases like "Prime Minister Tony Blair" and "Chancellor Gordon Brown" when they were still in opposition. 1) He seems to disagree with a lot of the statements that Ken Clarke makes. 2) Boris Johnson in office is now displaying what the Tories will be like on green issues once in office. He has already scrapped the extension of the congestion charge and there have been threats to the existing one also. 3) Shadow Ministers have far too many outside interests (especially William Hague) and are not taking their positions as a shadow cabinet seriously. 4) He promised to change the alignment of his party in Europe but has still not done so. This is a good one to niggle at because there are a lot of Eurosceptics in his party who are angry about this. Also, it is an example of a broken campaign promise, could this be portentous of what is to come? There are lots more things like this but I reiterate, they have to ring true. Not for the first time, Brown's supposedly razor sharp political antennae seems to have been found wanting. Edited to correct a couple of spelling mistakes. This story in the Mail on Sunday does not look at all good for Jacqui Smith. There are allegations that she is claiming her primary residence as being a house in London that her sister owns and hence can have claimed up to £20,000 per year for this residence. The estimated cost of the police protection she requires because of her residential choice is close to £200,000. As Home Secretary she could have a grace and favour apartment which already has police protection anyway but she refuses to. In order to be able to legitimately claim the £20,000 per year, the rules state that MPs must get value for money. According to the article they are also warned to "avoid any arrangement which may give rise to an accusation that you are, or someone close to you is, obtaining an immediate benefit or subsidy from public funds". The allowance must not be used to meet the costs of rent or a mortgage from 'a partner or family member'. And the rules say an MP's 'main home' will normally be 'a matter of fact' and 'where you spend more nights than any other'. So if the primary residence is to be claimed against, then she should be there on average for the majority of nights. Her spokesman when asked stated: "She tends to go home Thursday evenings and returns on Sunday or Monday." which has been pointed out is an average of three and a half days per week, not a majority and it will be interesting to see how many Mondays as opposed to Sundays there actually are. The thing that I found most interesting here however is that when this was pointed out to the spokesman, he said: "She doesn't count the number of nights.". In that case, how is she supposed to be able to know which is her primary residence!? The spokesman is trying to make it seem like a trivial irrelevance that is beneath the HS to be bothering with details like how many nights she spends at her primary residence. However because it is critical to determining if the rules have been broken, this is nonsense. Either she has not spent the bulk of her nights there which means it looks like the rules have been broken or she has. Ignorance should be no defence. Imagine if I could not be bothered to count how much tax I needed to pay each year and just submitted what I reckoned was right? Would I be able to get away with this? I think it is worth mentioning also that the spokesman said "She goes home on Thursday evenings...". This could be a slip of the tongue but even he seems to be referring to her Redditch residence as her home which most people usually use to mean her primary residence. Guido has pointed out that her advisers claims that the fees office have cleared her claim is disingenuous as they take the members word for it. This is typical Campbellesque spin to try and limit the damage which shows how deep the mire the HS could be in here. This all smells very bad to me and does not augur at all well for her prospects of holding onto her position as Home Secretary. Morus of Political Betting thinks that she will be able to tough all of this out and that Gordon Brown will do everything he can to save her. I was going to argue against this and that the allegations are so serious that once the media feeding frenzy starts her position will become untenable. However I have just had a look on the BBC News website and I cannot see any reference to this story, even on the Politics page so maybe he is right. It will be a disgrace if this is not followed up rigourously by the rest of the media. Perhaps this is another situation where bloggers may have to do the media's duty for them...? Further blog reaction here, here and here. Bottled Water will save the planet! in my local supermarket earlier today and it almost took my breath way. 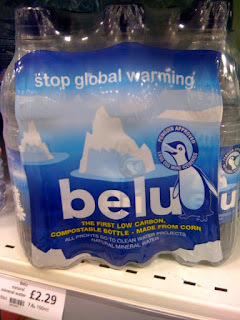 It is a brand of bottled water called "Belu" which has the text "Stop Global Warming" emblazoned across the top of the pack along with "Penguin Approved - Less CO2 More Icebergs" and the statement that they use "The First Low Carbon Compostable Bottle - Made From Corn". I have seen some greenwash in my time but this surely will take some beating. According to their wikipedia entry, the still water that Belu sell in these bottles is sourced from Shropshire and/or Wales. I live in Berkshire so the water will have been transported a fair way to get to my local supermarket using up a lot of CO2 in the process. Also, the genetically modifed corn that they use to manufacture the bottles is shipped from Nebraska. Now, they do offset their carbon emissions but offsetting is something that you do as a last resort after all other possible CO2 cutting measures and the jury is still out on how effective it is. There is a much more environmentally friendly way to get water than buying Belu, or any other brand of still bottled water and that is out of your tap. If the water in your area is a bit too hard, get a Britta filter. There is no excuse for wasting your money and (whatever Belu claim) unneccessarily contributing to carbon emissions in this way. They also claim to give all their profits to clean water projects in Africa but they have apparently refused to disclose how much this is. It looks like someone has had a bit of a coup and managed to get http://www.belu.co.uk/ registered before Belu so that they can point out their shortcomings! I wonder how long that will last for. According to Professor David Nutt of the Advisory Council on the Misuse of Drugs (ACMD), taking ecstacy is no more dangerous than riding a horse. He explained that 100 deaths a year are attributed to horse riding as opposed to around 30 deaths per year from ecstacy and: "This attitude raises the critical question of why society tolerates - indeed encourages - certain forms of potentially harmful behaviour but not others such as drug use." It's a very good question and one that I think it is society's and polticians duty to debate openly and honestly. Of course that is not going to happen. The Home Office have already made it clear that they disagree with him and that the expected advice from the ACMD to downgrade ecstacy will basically be ignored as were the last time they advised the government (see here). 1) David Nutt's position was explained. There was then a brief snapshot of David Raynes from the National Drug Prevention Alliance who predictably criticised the comments and effectively called for David Nutt's resignation. Then there was a quote from the Home Office along the lines of "ECSTACY KILLS!!??". There was no quote from any other organisation such as Transform Drug Policy Foundation (TDPF) or anyone else who believes that there should evidence based policy in this area as David Nutt is implying. So what we end up with is Professor Nutt looking like a dangerous maverick when actually he is advocating something that many people in this country agree with. I do not believe that the BBC deliberately do this sort of thing but the idea that drugs are evil is so embedded in the body politic of this country that it does not get treated like other issues. 2) The Home Office statement hinted that there may be a review of ACMD with relation to its advice to the government. Frankly I think this would be a good thing as they will soon have ignored it twice in a row. I think the ACMD was only ever there to give the impression that the government is listening to objective advice on this subject when it clearly is not, in the same way as they pretend through consultations such as the Heathrow shambles (see here). The sooner the government stops pretending it is basing its drugs policy on evidence, the sooner it can be exposed for the political posturing it really is indulging in. There is also a good post on Jock's Place today which goes further than Professor Nutt and says that most of the 30 deaths due to ecstacy each year are actually caused by prohibition because of the lack of information available and the variation in quality of the drugs and quantity of MDMA present. I have a lot of sympathy with this view also. The recent news that Michael Phelps has lost some of his sponsorship, some funding and has had a 3 month ban imposed on him by his sporting body has got me angry. Apparently he was photographed at a party inhaling what looked like cannabis smoke through a bong. There have been claims that he is "setting a bad example" and as a role model it is "appalling" that he should do something like this. 1) Michael Phelps is an absolute phenomenon. He won 8 gold medals in the 2008 Olympics which is a new record in itself. He has not however asked for this talent he has been blessed with - he is simply doing his best to maximise this potential and doing a fantastic job. 2) If he did take cannabis in the way it seems at a party, then all he is doing is what millions upon millions of young people across the western world do every year. Far from this being an extreme, unusual thing for a 23 year old man to do, it is absolutely normal. Why should he be held up to a higher standard than most other 23 year old men just because he is hugely talented at what he does? 3) If he had have been photographed drinking a "yard of ale" or doing shots of tequila, would there have been such an outcry? Of course not because alcohol is accepted and tolerated in western culture, even though it kills and damages (both mentally and physically) far more people than cannabis. 4) Cannabis is not a performance enhancing drug so what business have USA Swimming got in punishing Michael Phelps for doing something in his spare time? Michael Phelps is being made a scapegoat because he is in the public eye. He has apologised for his actions and I suspect he will not do it again, not because he has done anything immoral or evil, but simply because of the treatment he has had. The hypocrisy of this sort of thing makes me sick. The very people imposing the ban and hauling him over the coals will be sitting down to have a nice bottle of wine or a few glasses of whisky at some point over the next few days and will not see at all that there is any equivalence between what they are doing (taking a mind altering drug that is normal for middle class middle aged people) and what Phelps did (taking a mind altering drug that is normal for college aged young men). Triggered by a post on Norfolk Blogger, I have remembered that on Question Time the other night Nigel Farage (leader of UKIP) made some disparaging comment about global warming in the context of the recent cold weather. Later on an audience member made the point that with global warming, the weather in the UK would likely actually get much colder. Farage's response was an incredulous "Really!?". Now I assume that what the audience member was referring to is the gulf stream which could be weakened or even switched off by global warming although he did not get a proper chance to elaborate. I am not a climate scientist but I do try to keep abreast of the issues and for the leader of a fairly large political party in the UK to not even be aware of this but to still feel free to make sneering remarks about the cold weather appearing to disprove global warming is a pretty sorry state of affairs. I have heard many other (usually right wing) commentators and politicians make similar comments and it strikes me as very simplistic and almost childish to say things along the lines of "IT'S BEEN A BIT COLDER RECENTLY SO HOW CAN THERE BE TEH GLOBAL WARMING!!!111". As usual, misleading soundbites substitute for serious debate. With varying degrees of warmth/hostility, you all make similar points. I am, therefore, unusually, writing a group e-mail to thank you for getting in touch. For as long as first past the post elections exist for Westminster you will be frustrated and we will be forced to analyse the system we have. As we've made clear on the previous occasions we have polled marginal constituencies on Channel 4 News, we do so in part to replicate what the main political parties are doing, and give our viewers insights into what the party strategists are poring over. This includes a certain party that passionately supports PR but has to win seats under the current system. Our coverage frequently engages with those who are not in marginal seats and will continue to do so. I can't help thinking that your anger, where it was registered, is really directed at the government and certain political leaders ... not at us. I certainly hope so. I suppose his point is fair but although my e-mail was not angry as such I was directing my comments at Channel 4 News. The government and main opposition party have a vested interest in the existing system as has been demostrated by Labour's refusal to honour its 1997 manifesto commitment to hold a referendum on electoral reform. I will continue to press this issue at events where senior politicians are present and join in campaigns aimed at them, however I have come to the conclusion that it will take grassroots campaigning to bring this issue to the fore so that government and parliament cannot ignore the issue and news organisations like Channel 4 can help by not just going along with the existing system but questioning why only a few thousand votes in marginal constituencies really count. Blair gets one over on Brown - again! Apparently Tony Blair has met President Obama at the "National Prayer Breakfast" and made a very well received speech at the podium prior during the event. Here is the video courtesy of Peter Hoskin of The Spectator. This is before Gordon Brown has even had a look in! I hope his aides have got some spare mobile phones lined up! Aside from the amusing nature of Blair besting Brown yet again (but in such a way as he can hardly be seen to complain - politically very astute) I think it does say something about how the Obama administration views Gordon Brown and his government. They would surely have been aware that having Obama and Blair at the same event would be a bit of a slap in the face for Brown. I can't help but feel that there might be a subtle message being sent here. In response to a survey from Reading List I have posted up some information about myself in the comments section here. A1 - Who are you? A3 - When did you write your first post? A4 - How many posts have you written in total? B1 - What are your main areas of interest? Electoral reform, Evidence Based Policy for things like drugs, Green and environmental issues, Keeping an eye on the political classes! Only those listed above really. Yes – my company Southfacing Services (http://www.southfacing.co.uk/) works in the field of energy efficient buildings and computer software. I am a big fan of older TV from the 70s and 80s mainly. Most of the stuff that is covered by the “TV Cream Era” (see http://tv.cream.org/ for details of what this means), especially things like Survivors, Day of the Triffids, Blakes 7, The Prisoner etc. C1 - What are your connections with Reading? I used to live in Lower Earley (2000-2001) and also right next to the Oracle on that new estate in the centre (2002-2003). My company has its offices in Berkshire House on King’s Rd. C2 - What do you think is the best thing about Reading? There is a lot going on and it has a vibrant centre. It is also very easy to travel to other places with Reading Station being one of the main interchanges in the country. The Majedski stadium is a great sporting venue. C3 - What do you think is the worst thing about Reading? Some areas are not great and there is often a lot of rubbish lying around. C4 - How would you like to see Reading change in the future? I think more initiatives to keep it clean and also to reduce the amount driving in and out of the town would be good. Would you be interested in participating in future Reading List Blog Network initiatives? I noted with interest your voting intentions poll last night where you explained that you were concentrating the poll where it “really matters” and went on to explain that it is the seats where David Cameron will be targeting most of his efforts as they are the marginals that will make the difference between him forming a majority government and not. I have to say that I find this state of affairs deeply undemocratic. Why is it that the views of a voter in Amber Valley or Reading West is considered to be much more important than the views of say myself living in the fairly safe Conservative seat of Bracknell? I fear that what will now start to happen in the run up to the inevitable election next year is that these and other marginal constituencies will be heavily targeted by the main parties and the policies and manifestos will be tailored to suit the floating voters within these constituencies. This subset of a subset of voters will likely only number of few tens of thousands and therefore the vast majority of the British electorate will again be disenfranchised. I have always enjoyed Channel 4 news and I feel that your coverage of issues is generally excellent but I very strongly feel that when you cover things like the polling in marginal constituencies, you owe a duty to your viewers to explain the consequences of this sort of focusing, why it happens and how it means that only a very small proportion of the electorate have real influence at election time. I would also like to see more coverage of the potential alternatives to the current First Past the Post system such as Single Transferable Vote in Multi Member Constituencies as advocated by the Electoral Reform Society which could make things much more proportional whilst maintaining a constituency link (see http://www.electoral-reform.org.uk/article.php?id=48 for more details). I understand that covering these issues requires a certain degree of engagement by the audience but I am fairly sure that the majority of your sophisticated audience would be able to grasp the necessary concepts and it could help kick-start a wider debate about the unfairness of the existing system. If you want to e-mail them too you can do so through gary.gibbon@itn.co.uk or news@channel4.com. UPDATE: Gary Gibbon has responded. Details here. This puts me a lot closer to the Green Party! I do have quite a lot of "green" views which might explain this. I was surprised at how left wing I seem to be though. I was brought up in a pretty left-wing environment with my parents, grandparents and other relatives all stalwart supporters of Labour (when they were actually socialist) but I thought that I had moved a lot more to the centre on many issues. It just goes to show how much your upbringing affects your views on things even subconsciously! 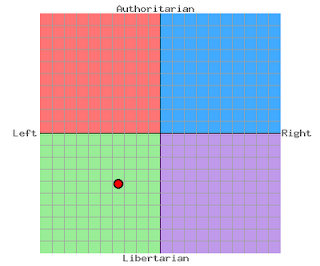 I still think that this test has placed me too far left though. 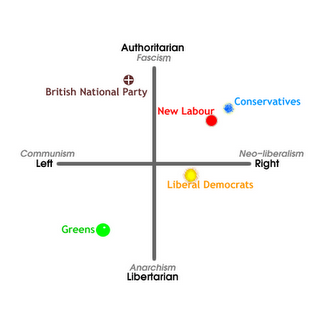 Anyway, I am vindicated in my view that the Lib Dems are the closest of the main parties to my views as I had suspected and my libertarian credentials are firmly intact. One final thought here - it would be interesting to revisit the top chart in a few years if Labour end up in opposition to see where they are placed then. I am certain that they will move more left-wing and less authoritarian. Right, well Stephen Tall from LDV has tagged everyone on the LibDemBlogs aggregator to list 25 random things about themselves. Apparently I am supposed to tag 25 more people but seeing as if everyone did that, in about 7 generations (25 to the power 7), the entire population of the world would have been tagged I think I can safely not do that. 1) I was on Question Time a couple of years ago and had a brief rant about John Prescott. 2) I have not drunk any alcohol since the year 2000. 3) I have been in several amateur dramatics plays and the lead in a couple. 4) I once stuck a small piece of chewing gum on the windowsill of Jack and Vera's house in Coronation Street at Granada Studios and it was visible on the programme for a number of years afterwards. 5) I have a degree in computer science and maths. 6) I part own and am a director of my own software and building design company. 7) I can juggle three balls (many patterns) and four balls. 8) I have only not voted once when a family emergency took me away from the locale of my polling station at short notice. 9) As a child I produced a cartoon strip called "The Little Sheriff" which ran for over 200 episodes. Some of them were published in the school magazine. 10) I have been friends with two different people called Steven McLaughlin and they have both died (one aged about 18 and the other about 28). 11) I once got Bob Mortimer's signature on a Big Mac box. 12) I think Mark E Smith is a genius. 13) I have walked on a glacier and it was one of the best experiences of my life. 14) I had many contributions read out on the Mark and Lard Radio 1 afternoon show. 15) I have moderate vitreous floaters in my left eye. 16) I can recite the alphabet backwards and in the order of a QWERTY keyboard. 17) I used to be a massive fan of Prisoner Cell Block H when I was a teenager. 18) My favourite film is Trainspotting. 20) I can't do a convincing Geordie accent. 21) I once wrote to the BBC when I was a kid to ask if I could go on Grange Hill. They politely declined. 22) I am fascinated by things relating to TV of the past e.g. continuity announcments, ITV regional idents, IBA start-up sequences. It came as a surprise to me as I was growing up that hardly anyone else is interested in these things. 23) Between 1992 and 2004 I moved house 13 times.